Situated just across from the beautiful Église Saint-Sulpice, the Café de la Mairie is a great spot for breakfast, a light meal, and people watching. This small café enjoys an enviable location in a lively area of Paris. Its large terrace provides a wonderful place to sit and admire the beautiful Saint-Sulpice Church (map) while you have your café crème, a glass of wine, or a light lunch or supper. Café de la Mairie has been a gathering place for writers and others for many years. We enjoyed breakfast here on a quiet Sunday morning the day we arrived in Paris. As we sipped our coffee, we watched the neighborhood wake up and come alive. Later we returned for supper, enjoying hearty sandwiches made on the famous Poilâne bread—a hearty sour dough bread made with stone ground wheat. The café's menu is limited—sandwiches, omelettes, salads—but adequate for a light meal, and prices are reasonable for the area. And of course, Café de la Mairie offers various coffees, teas, wine, beer, juices, and more. And what does the name mean? La Mairie is the town hall, in this case the town hall for the 6th arrondissement (each arrondissement in Paris has its own Mairie). The Mairie is just down the street on rue Bonaparte. 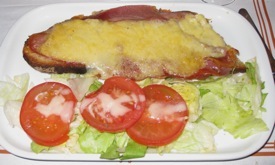 Above: A special croque-monsieur, a grilled ham and cheese sandwich on Poilâne bread. Below: Racks of Poilâne bread at the bakery, Paris.